Assistant Professor, Gümüşhane University, Department of Health Management, Faculty of Health Sciences, Gümüşhane/TURKEY 2019-present. Assistant Professor, Gümüşhane University, Department of Quantitative Methods, Faculty of Economics and Administrative Sciences, Gümüşhane/TURKEY 2018-2019. Research Assistant, Ph. D., Gümüşhane University, Department of Quantitative Methods, Faculty of Economics and Administrative Sciences, Gümüşhane/TURKEY 2018-2018. Research Assistant, Istanbul University, Department of Quantitative Methods, School of Business Administration, Istanbul/TURKEY 2011-2018. Research Assistant, Gümüşhane University, Department of Quantitative Methods, Faculty of Economics and Administrative Sciences, Gümüşhane/TURKEY 2010-2011. Co-Founder, Alphanumeric Journal, The Journal of Operations Research, Statistics, Econometrics and Management Information Systems 2013.
. Özdemir M., Boz C., Önder E. , Performance Evaluation of Turkish Banks Between the Years 2012-2017, International Brand and Brand City Congress, September 27-29, 2018.
. Boz C., Özdemir M., Önder E., Comparison of BRICS Economics and Turkey Economy: Economic Performance Evaluation Based on TOPSIS, International Brand and Brand City Congress, September 27-29, 2018.
. Önder E., Boz C., Özdemir M., An Overview of Multi-Criteria Decision-Making Methods for Financial Performance Analysis,International Brand and Brand City Congress, September 27-29, 2018.
. Özdemir M., Cura T., “Parallel Local Search Approach for Maximum Dispersion Problem”,Ulaştırma ve Lojistik Ulusal Kongresi, 26-27 Ekim 2017, İstanbul.
. Özdemir M., “Particle Swarm Optimization for Continuous Function Optimization Problems“, International Journal of Applied Mathematics, Electronics and Computers, Vol 5, No 3, pp.47-52, 2017.
. Nisel S., Özdemir M., “Analytic Hierarchy Process & Analytic Network Process In Sport: A Comprehensive Literature Review“, International Journal of the Analytic Hierarchy Process, ISSN 1936-6744, pp. 405-429, Vol. 8 Issue 3 2016.
. Yıldırım B. F., Kuzu S., Özdemir M., “Evaluating Mobile Operating Systems Using Fuzzy VIKOR Approach“, Afyon Kocatepe University Journal of Economics and Administrative Sciences, ISSN: 1302-1966, pp. 79-95,Volume 18, Issue 1, 2016.
. Arıcıgil Çilan C., Taş N., Özdemir M., “Determining the Profile of Individuals’ Internet Usage in Turkey by Latent Class Analysis”, Dumlupinar University Journal of Social Sciences Special Issue of 14th International Symposium on Econometrics Operation Research and Statistics, ISSN:1302-1842, pp. 403-418, October 2014.
. Eroğlu E. , Yıldırım B. F., Özdemir M., “Oreste Method in Multi Criteria Decision Making and Personnel Selection Application”, Istanbul Universitesi Isletme Iktisadi Enstitusu Yonetim Dergisi, ISSN: 1302-4221, pp:81-95, Volume 25, Issue 76, June 2014.
. Önder E., Yıldırım B. F., Özdemir M., “Multi Criteria Decision Making for Evaluating Tourism Destinations in Turkey”, Academıc Journal of Tourısm and Management Researches, pp. 1-15, Volume 1, Issue 1, 2013.
. Önder E., Özdemir M.,Yıldırım B. F., “Combinatorial Optimization Using Artificial Bee Colony Algorithm and Particle Swarm Optimization Supported Genetic Algorithm”, Kafkas University Journal of Economics and Administrative Sciences Faculty, ISSN: 1309-4289, pp. 59-70, Volume. 4, Issue 6, 2013.
. Çilan Arıcıgil, Ç., Özdemir M., “Measuring Domestic Digital Divide By Using Latent Class Analysis: A Case Study Of Turkey”, Journal of the School of Business Administration, ISSN: 1303-1732, pp. 219-234, Volume: 42, Number: 2, 2013. 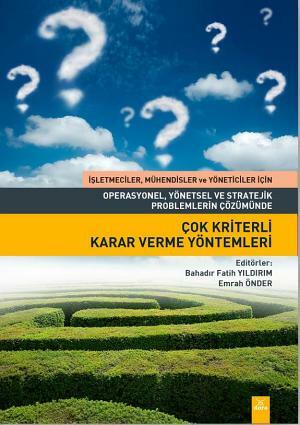 Özdemir M., Chapter Name: TOPSIS, Multi-Criteria Decision Making Methods for Solving Operational, Managerial and Strategic Problems, ISBN: 978-605-4798-84-1, pp. 133-153, Dora Basım-Yayın Dağıtım, Bursa, 2014. Özdemir M., Ed., “Multi-Criteria Decision Making Methods with Annotated and Comparative Health Sciences Practices”, Nobel, İSTANBUL, 2018. ISR Journal, The Journal of International Scientific Researches, 2018-present. Global Journal of Economics and Business Studies, Area Editor, 2018-present. Spreadsheet applications in Business, Master of Business, Gümüşhane University, fall 2018. Computer Applications in Business, Undergraduate, Gümüşhane University, fall 2018. Introduction to Programming with R, Undergraduate, Gümüşhane University, fall 2018. Quantitative Methods in Health Sciences, Undergraduate, Gümüşhane University, fall 2018. Spreadsheet Modeling, Undergraduate, Gümüşhane University, spring 2019. Statistics II, Undergraduate, Gümüşhane University, spring 2019.
Business Math, Undergraduate, Gümüşhane University, spring 2019. Data Analysis with R Programming, Graduate, Gümüşhane University, spring 2019. Artificial Intelligence and Its Applications in Businesses, Graduate, Gümüşhane University, spring 2019. Ph. D., Quantitative Methods; Istanbul University, School of Business Administration, Istanbul, Turkey, September, 2018 Dissertation Topic: “A New Heuristic Optimization: Search and Rescue Algorithm and Solving the Function Optimization Problems”. M. A., Quantitative Methods; Istanbul University, School of Business Administration, Istanbul, Turkey, June, 2013 Dissertation Topic: “Solving the Team Orienteering Problem with Time Windows by Using the Artificial Bee Colony Approach”. B. B. A., Selçuk University, Faculty of Economics and Administrative Sciences/Business Administration, Konya, Turkey, June, 2009.